It is possible that as early as 1883 Seurat was formulating his ideas for large painting, complementary to the Bathers at Asnières (which had been exhibited in 1884) but according to a letter to Félix Fénéon written some years later, he started work on A Sunday on the Island of the Grande Jatte in May 1884. He worked on drawings and small oil studies (which he called croquetons), sketching out particular aspects of the planned design, making multiple visits to the site and recorded numerous observations. Indeed, in 1884 he exhibited a small painting Landscape – The Island of the Grand Jatte, depicting the exact section of the island from the same viewpoint as the finished painting but completely devoid of any figures. It seems that in the spring of 1885, he had completed the basic composition and that he originally planned to exhibit the painting that year. This did not happen and after spending the summer of 1885 in Normandy working on his coastal paintings he returned to Paris to continue work on the Grande Jatte, adding a layer of dots of pure colour, adjusting and tuning the colour contrasts and harmonies. Seurat had not applied these dots during the initial stages of work on this picture – he used various methods of applying the paint – some of an impressionist nature. It was only at the final stages of the work’s gestation that he added the dots. A Sunday on theIsland of the Grande Jatte was first exhibited at the Eighth (and last) Impressionist Exhibition and it dominated the room allocated to Seurat, Signac and Camille Pissarro and his son Lucien. Indeed the painting created a sensation. The anarchist writer and art critic Felix Fénéon later coined the phrase ‘Neo-Impressionism’ to distinguish this new approach from the earlier generation of Impressionists whose works were on show in the other rooms. This painting, and the reaction to it, established Seurat as the de facto leader of a new avant-garde movement. The Grande Jatte is an island in the middle of the river Seine directly opposite the location Seurat chose for the Bathers. Here, instead of depicting a working class idyll as in the Bathers, his subjects were primarily, although not exclusively, the bourgeoisie, many in their formal attire even when at leisure on a Sunday afternoon promenade. In this respect the Grand Jatte takes a theme so popular with the impressionists – modern Parisians at leisure – but Seurat presents us with a decidedly anti-impressionist painting. As with the Bathers, his aim was to record contemporary life but in a way that might echo the classical past evoked by the Arcadias of Puvis de Chavannes. He rejects the Impressionist idea of capturing the fleeting moment – rendering a glimpse of a motif modelled in light and colour on a rapidly worked canvas – Seurat’s monumental painting was anything but spontaneous – it was the result of a great deal of work over a long period of time. Yes, his interest in portraying the life of ordinary people chimed with the Impressionists but his methods were antipathetic to their aims. Gone was the immediacy and spontaneity of Impressionism. The Impressionist approach was instinctive and empirical and they often worked en plein air whereas Seurat worked much more deliberately, building up a composition in the studio (with the help of many studies) over a period of time and, in another departure from impressionist orthodoxy, delineating his figures with discrete lines. Camille Pissarro labeled the two approaches romantic and scientific Impressionism. Seurat’s figures exude a timeless, hieratic quality, as though lost in an endless reverie, unable or unwilling to interact. This tone is set by the prominent couple to the right who, like so many of their fellow promenaders, stare out fixedly across the waters of the Seine; both ramrod straight, the gentleman, resplendent in top hat with a floral buttonhole in his frock coat and a cane wedged under his arm; the lady’s dress suitably embellished with a fashionable bustle and carrying a parasol lest the sun prove too much for her complexion. It is almost as if they are standing to attention as a grand and formal procession moves past. The woman’s dog, sporting a bow attached to its collar is one of the few points of animation in the picture – even her monkey seems momentarily transfixed. Nearby two men gaze languidly across the river and a woman is engaged in her sewing. They occupy the same plane and orient themselves in the same direction. 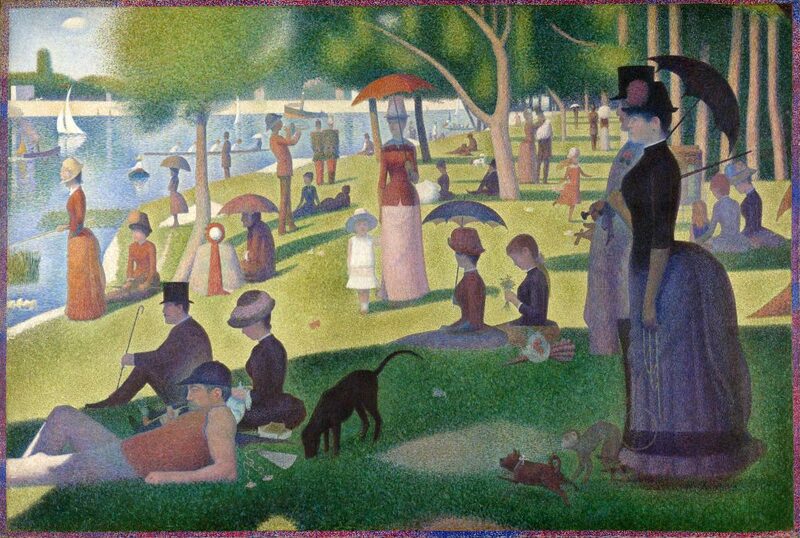 A few paces behind, a woman with a parasol and her daughter, in a white dress, face outwards as though Seurat has precisely measured the ninety degree shift. With the exception of a couple in the middle distance who seem to be comforting a baby, there is no interplay between the many figures in the composition. A young girl is seen running nearby – she is frozen on one leg – stasis is the order of the day. Others move soundlessly across the manicured grass. A man plays a french horn – perhaps an unwelcome intrusion on such an afternoon. while some are engaged in appropriate pastimes – a woman is fishing as is a man in a dinghy – a four man skiff glides past. There are more craft out on the water including two steam launches – a passing reference to modernity. The surface of the Seine seems to be serene and yet a yacht with billowing sails would suggest more breeze than seems to inhabit the rest of the composition. And in the distance, close to the shore of the island, there is an intriguing link to Seurat’s first monumental painting. A small boat can be seen flying a prominent tricolour; this would seem to be the same craft that is shown more prominently in the Bathers at Asnières, seemingly a ferry connecting the bank to the island and therefore perhaps a way in which Seurat alludes to a link between the two paintings. While many critics were full of scorn, just as many were fascinated by Seurat’s technique and intrigued by the stiff formality of the figures, drawing parallels with early renaissance, pre-renaissance and even Egyptian art. Indeed it is not difficult to see similarities between Seurat’s static figures and those haunting inhabitants of Piero della Francesca’s work. The Belgian poet and critic Emile Verhaeren wrote ‘The Grande Jatte is painted with a primitive naiveté and honesty. In front of it, it is of the Gothics that one thinks.’ However, many were concerned with the implausibility of Seurat’s flâneurs. One critic opined that ‘we cannot appreciate his Sunday on the Grande Jatte… where the figures are drawn like poorly made mannequins’, while another compared them to ‘figures made from wood… like little soldiers that come to us from Germany.’ A group of more supportive younger commentators, led by Félix Fénéon viewed the painting in part from a symbolist viewpoint – seeing Seurat’s figures as stylised ‘types’ rather than purely descriptive. Seurat was perhaps not overly interested in the relationship between his cast of characters and the landscape – he resisted the expectations of some critics and the public to produce a simulacrum of reality. Perhaps the last word should go the the artist himself, who in a conversation with the critic Gustave Kahn a couple of years after the completion of the Grande Jatte, stated that “the Pathenaeans of Phidias formed a procession. I want to make modern people… move like the people on those friezes”.